Perhaps one of the most interesting dimensions to the recent surge in federalism interest in Iraq’s Sunni-majority areas are those Sunnis that still don’t like the idea of federalism. We have been in a similar situation before, with the Shiites. 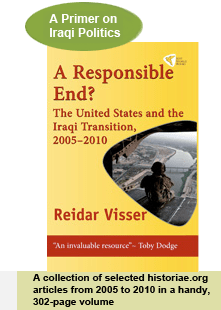 Back in 2005, when SCIRI suddenly declared its interest in a big Shiite region and the Western mainstream media promptly announced a general pro-federal tendency among Iraqi Shiites, it was internal Shiite opponents of federalism that ultimately torpedoed the whole project. Back then, at least to some extent, it seemed that popular resistance against sectarian federalism had prevailed. Since Iraqi Sunnis began discussing federalism in earnest in late 2010, there have been three distinctive rounds of reactions. Firstly, in the autumn of 2010 the provincial council in Anbar adopted a stance on the development of the Akkaz gas field that in practice amounted to federalism – and at least some local politicians openly advocated federalism. At the time, however, there were plenty of prominent, dissenting voices within Anbar itself. Second, when parliament speaker Usama al-Nujayfi seemed to embrace something tantamount to Sunni sectarian separatism in late June 2011, there was also no lack of internal critics. Leading politicians from both Mosul (Nujayfi’s hometown) and the Iraqiyya coalition (Nujayfi’s political party) criticised the move. Thirdly, there has been a separate wave of reactions to the latest bid by the governorate council in Salahaddin to request a federal referendum. In the case of Salahaddin, perhaps the most prominent feature is that it has been somewhat difficult to identity leading Sunni local politicians opposing the bid. Vocal opposition has mostly taken the form of threats about sub-governorate separatism, which in turn has a (Shiite-minority) sectarian dimension. One of the few publicised signs of local opposition was a meeting between the Shiite premier, Nuri al-Maliki, and a number of unspecified tribal shaykhs of the governorate. For what we know, they may well have been Shiite Dujaylis. Outside Salahaddin, however, negative Sunni reactions remain numerous. There have been anti-federal tribal conferences in Anbar (Dulaym,) and Nineveh (the Jubbur tribe). Also in Kirkuk, Diyala and Mosul, many Sunnis remain sceptical of federalism more generally. Urban politicians in Mosul still call for the intervention of the (Shiite-led) Iraqi army to counter Kurdish assertiveness in the oil-rich disputed territories where Exxon recently signed deals. It is however true that there is some Sunni-led sub-governorate separatism underway as well, for example in the demand that Falluja be separated from the rest of Anbar in a reaction to perceived dominance by Ramadi. There are signs Maliki is reaching out to the long-exiled amir of the Dulaym tribe, Majid Sulayman, in order to counter the pro-federal current in Salahaddin. The problem with Sulayman (and other exiles) is that he may well be out of touch with local sentiment in the Sunni areas. Symptomatically, perhaps, Maliki’s detractors made a big point of the fact that Izzat al-Duri, the exiled Baathist leader, shared his criticism of the federal project in Salahaddin! If Maliki is smart, he will reach out to those local politicians on the ground in the Sunni areas that still reject federalism. If he is to maintain some semblance of democracy in Iraq, he will need more than Sunni figureheads from White Iraqiyya or Tawafuq and tribal sheikhs – Saddam Hussein, after all, had excellent relations with many Shiite shaykhs, including Maliki’s own Banu Malik. In Anbar, the deputy governor, Hikmat Jasim Zaydan, recently expressed scepticism towards federalism as a step towards sectarianism and partition. That is an example of the kind of politician to whom Maliki could try to reach out. Interestingly, Ayyad Allawi, the leader of the secular Iraqiyya has come out with exactly the same position as Maliki: The time is not right for more federal regions. Of course personal relations between him and Maliki are notoriously bad. Allawi could use this situation for two different purposes: Either he could embark on the unlikely project of reconciling with Maliki, or he could exploit the situation to win more support on the ground in a situation when the Nujayfi camp appears to be betting on the federalism option. Are we still convinced that the current Sunni pro-federal trend is really more than SCIRI’s call for a Shiite region in 2005?